as an NES-era kid, i find it extremely difficult to go back and play anything pre-8-bit, but today i was looking for a quick game to finish and so i sat down and played through the almost-as-old-as-i-am adventure for atari 2600, originally released way back in 1979 (a free web browser version is available on atari’s website). although the game doesn’t seem to be that well known now, it seems to be often cited as being historically significant. 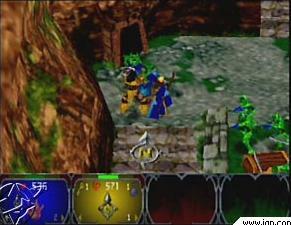 for example, in 2003 IGN’s editors ranked it as #95 in their list of greatest games of all time commenting: “A title that’s full of firsts: the first graphical adventure (it was actually inspired by a text-based game of the same name), the first game to introduce objects players could pick up and move and the first Easter Egg in videogame history (hidden credits for the lead programmer/designer Warren Robinett).” it seems to be often seen as a precursor to such hits as the original legend of zelda so i was interested in trying it out. the game is definitely primitive, and this is probably the most amount of time i’ve spent playing any old-school atari game. after i pieced together what the heck was going on (with some help from the instruction manual) i rather enjoyed playing through all three modes. despite the primitive gameplay and presentation (like strong bad, i still don’t see how in the world anyone could think the dragon looks like anything other than an oversized duck), the game makes the most of the available technology and comes up with what presumably are some interesting solutions to the limitations, including the problem of items getting stuck in walls. the game has many distinctly memorable moments, including the first time you slay a duck, i mean dragon, catch sight of the glowing chalice, cross over the bridge, and experience the victory of returning it to the safety of your castle. it’s difficult to say how much other games were influenced by this one and how much of the design was inevitable, but there’s no doubt that the game was the first of its kind and is still a must-play for anyone interested in the history of video games or is open to the charms of this surprisingly still-entertaining early video game. as an addendum, i actually have a closer tie to this game than i’d originally realized. when i was a kid i used to play computer games at the local library, and i loved playing two games they had, rocky’s boots from 1982 and gertrude’s secrets from 1984. it turns out that those games were also by warren robinett and that the gameplay was closely modelled on the original adventure. no wonder i was having flashes of deja vu. one of these days i’m going to have to track those down and play them again. – one player’s nice tribute to the game, by someone who has apparently poured in “hundreds” of hours into this game. wow. – apparently someone made a prettified version of the game called adventure 2600 reboot. here’s a preview video. – apparently the game is heavily based on a text adventure called colossal cave adventure. more info on that can be found on this fansite. 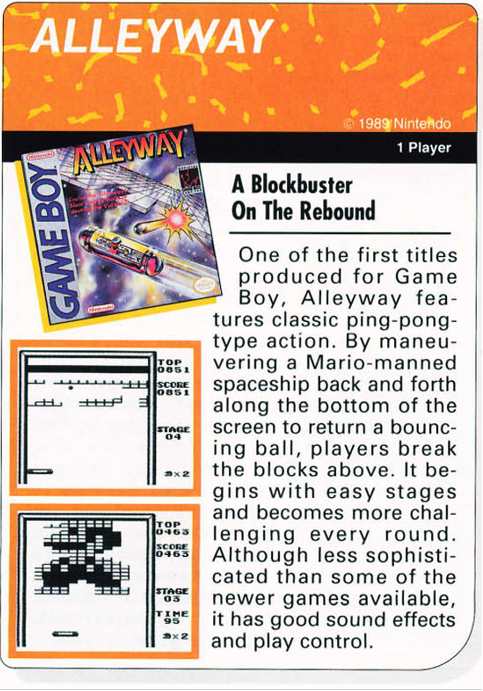 alleyway seems to get universally panned and dismissed as a decidedly inferior clone of arkanoid which came out in the arcades in 1986 and on the NES a year later. in many ways this game seems like a huge step back as it doesn’t feature any powerups whatsoever, or even much level variety: each level repeats 3 times (with variations due to moving blocks). there are eight of these trios of levels, and each group is followed by a bonus board featuring a mario character, ending in a showdown against the king of the koopas, bowser himself. the game does get somewhat harder since the ball travels noticeably faster in the later stages, but for the most part there’s not a whole lot to keep your attention. the sprites are small and undistinguished (much like its fellow launch title super mario land which i reviewed last year). even the physics seem a little stiff: according to wikipedia “the ball will only travel at 15°, 30° or 45° angles”. this leads to some extremely repetitive patterns, although “the ball cannot be locked in an infinite loop of ricochets. … the ball will travel at a slightly raised or lowered angle depending on its current trajectory, and will break out of the loop.” the game also includes different speeds for your paddle (faster if you hold the A button and slower if you hold the B button). despite all of these shortcomings (i seem to say that phrase a lot), eventually i rewound my mind to the game boy’s early days and began to enjoy the game for what it is instead of what it isn’t. as a launch title it definitely had major limitations, but it provides enough entertainment and challenge to make it worth playing, and the mario cameos and variations within each set of levels provide just enough personality to distinguish it from similar games. 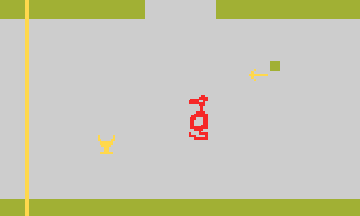 i found it interesting to compare this not to arkanoid, but to atari’s arcade classic breakout from 1976 (which in turn was directly influenced by that granddaddy of them all pong from 1972). this video of the atari 2600 version of breakout made me think of alleyway as coming before arkanoid instead of after, which it didn’t, but given the technical limitations of games for the game boy at launch the comparison to breakout seems a bit fairer. in any case i’m looking forward to trying out more old-skool game boy games sooner than later. psst. want some cheap alleyway links? – this fan review at retrogamer.net will make you want to play the game. this review at meanmachinesmag.co.uk will do just the opposite. – the game had a cursory mention in nintendo’s game boy player’s guide, receiving scores of: graphics and sound: 3.3, play control: 3.9, challenge: 3.3, and theme and fun: 3.2. i’ve archived the scan here. – the game also got a brief mention in nintendo power #9. scan archived here. – the official nintendo page (in japanese) doesn’t have much info, but here’s the google translation if you’re interested. i’ve been really slow about playing N64 games, but i finished gauntlet legends a couple of days ago. i was actually surprised at how much i enjoyed this game. it seems one of the main complaints about the game is that it’s so easy, but after having played some more effortful games recently it was actually nice to have something completely mindless. it was also one of the few games i could not only coerce the bf to play with me once but that he enjoyed enough to play with me a second time. i haven’t played a whole lot of hack ‘n slash games and no doubt the genre has evolved a lot since the 8-bit gauntlet days, but there was a lot i liked about this, the series’ first 3D iteration. first off, a lot of the elements of the original 8-bit gauntlet (and its sequels) that you know and love are intact, including the 4 characters (warrior, valkyrie, wizard, and archer) who are all still distinct, and the great voice samples (“i like food!” being one of the clear favorites, although we don’t get to hear my favorite line from the 8-bit days which was “wizard has shot the food!” since, thankfully, you’re not able to shoot food in this game). in terms of additions, unlike the original game and the arcade version of legends the console versions don’t have your life ticking away every second. this of course makes the game much easier, as does the addition of turbo moves (your “turbo” meter continually recharges), a whole slew of powerups, and, most importantly, the ability to level up and buy stat upgrades (i.e. strength, speed, magic, and armor). so although the four character classes have varied starting stats and growths, over time the differences become much less apparent. the game also lets you pick the color of your character, which changes its model, and also includes animal skins of the four classes (e.g. falconess for the valkyrie) which, while not really adding anything, are kind of a nice little addition. the game includes a world hub where you can choose any level you’ve already unlocked, and so the game becomes trivially easy since you can level up as much as you want before tackling harder levels. but even with its two harder difficulty settings (which didn’t seem that different to me when i took a cursory look at them) the game would still be pretty easy. a lot of this seems to come from the fact you can take out most enemy generators from far away before they’ve had time to spawn many enemies; in this game generators don’t spawn enemies until you get near to them, but i believe in the original 8-bit games they spawned enemies as soon as you start the stage, thus building up oceans of enemies for you to tediously plow through. and if you save the powerups you get and sell them instead of use them, you won’t have to spend much time level-grinding, if at all. i didn’t start off being very methodical about traversing the stages, so i ended up repeating a fair number of the levels because there are hidden items you have to find to beat the game (i.e. “obelisks” which allow you to enter other worlds, and “runes” which allow you to tackle the final boss) as well as optional items (e.g. the secret characters, weapons for use against the bosses). and you’ll find yourself wanting to repeat easier levels just to collect more health. without those repeats the game would’ve been more of a challenge, but the fun of the game really isn’t about the difficulty anyway. another thing that people complain about is the graphics, which despite being N64-level didn’t bother me at all (although apparently the dreamcast version is better). the game does make use of the N64 expansion pack though. given that the screen could be full of enemies and up to 4 players, all in 3D, the sprites aren’t incredibly detailed, but they work much better than most of the screenshots would suggest. i also found the progression of the levels to be well paced: the first world contains levels that are mostly linear; the second world contains levels that are more maze-like, like the original gauntlet; the third world contains more large open field-like areas where you’ll find yourself surrounded by enemies on multiple sides, along with a fun level climbing up and down the rigging of an airship; and the fourth and final worlds are twistier and generally much less linear with more back-tracking. in the latter levels there are some areas where you’ll be a bit lost, but that generally comes more from the confusion from the graphics and areas looking too similar to one another than anything else. the automatic camera in general also works pretty well, and the music is fine although not particularly memorable. the enemies aren’t quite varied enough, but they’re serviceable. my primary complaint, and one shared by others, is the inclusion of boss battles; they’re mostly pointless, mainly because the bosses all have attacks that are completely unavoidable and unblockable. so overall this one was a pleasant surprise and has lead me to spending a lot more digital ink on it than many other games i’ve played this year. i actually found it to be more enjoyable than the x-men legends game i played a couple of years ago, i think largely due to it having more variety and level design. there’s a remake with more levels and characters called dark legacy that came out on the gamecube that i’ll def. have to pick up at some point. and if you’re wondering, in terms of the three console versions of gauntlet legends IGN rated them in this order: dreamcast: 8.4, N64: 7.7, and PS1: 7.2. it looks like the PS1 version, while taking the hardest hit in the graphics department, has the inclusion of 4 additional hard levels after you beat the game. you are now entering the dungeon of links!